Godspeed You Black Emperor! - "Lift Your Skinny Fists Like Antennas to Heaven"
This double disc set from the Montreal collective known as Godspeed You Black Emperor! is their second full-length album and a bonafide masterpiece. Four lengthy instrumental tracks sum up the human experience across a landscape littered with the refuse of the present and the past. From plaintively ambient passages to searing highs of intensity, this is music that cannot help but evoke powerful emotions in the listener. The second piece, Static, begins with an ominous drone, the sound of a train fading in and out, as the listener is taken through a post industrial world of abandoned warehouses and decaying waterfronts. Voices drift in and out, suggesting spiritual emptiness, yet still retaining hope in a silent universe. The music is a hundred different shades of melancholy, brooding anger, and outright defiance, all of it underscored with a feel of menace. This is certainly the darkest piece on the album, ending with a dissonant and fearful passage of shivering cymbals and jarring drones. The second of the two disks opens with Sleep, and the voice of an old man recalling the glory days of Coney Island when you used to be able to sleep on the beach at night. A theremin-like instrument evokes the feeling of old memories, bringing emotional depth to the piece. Sleep rages with an intensity that is both frightening, and achingly beautiful. The final piece on the album, Antennas to Heaven, opens with an acoustic guitar roughly playing "What'll We Do with the Baby-O". Washes of ambient sounds and clinking notes well up from underneath, and the listener is propelled once again into another voyage of emotional troughs and peaks, this time revealed through dense ambient textures and sonic soundscapes, punctuated with brief passages of percussive frenzy that have a slightly brighter cast, as if a few rays of pallid sunlight are making their way through the clouds. Lift Your Skinny Fists Like Antennas to Heaven is so full of rich contrasts in sound and emotion, that it can be almost disorienting at times, but it's a welcome disorientation, shaking the listener from his or her complacency and revealing a world of stark beauty that we normally only glimpse from time to time. 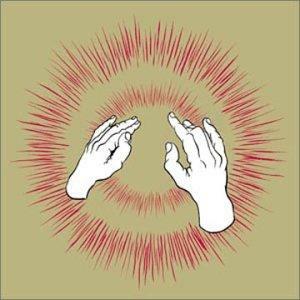 You can visit Godspeed You Black Emperor! at their official web site. Contact the band by snail mail at PO Box 2; Place-du-parc; Montréal, PQ; H2W 2N9; Canada. You can visit the Kranky Records web site. Contact Kranky via snail mail at PO Box 578743; Chicago, IL 60657. You can visit the Constellation Records web site. Contact Constellation via snail mail at PO Box 42002; Montréal; PQ; H2W 2T3; Canada.